Words cannot describe how incredibly tired I am. I’m due with baby number three tomorrow and it feels like he’s never going to arrive. My hips hurt badly, I’m not sleeping well, and I’m generally just really irritable. 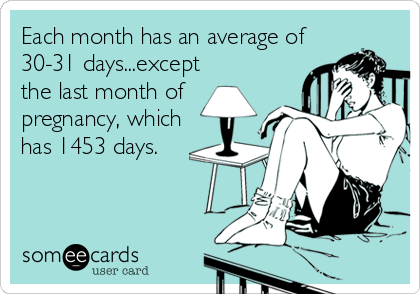 It’s also my last baby and I feel like I should be enjoying the end of this pregnancy more, but I’m really struggling with doing that. It’s a bittersweet thing, knowing that I’m so close to having this baby but also knowing that we aren’t intending to have more kids. I’ll be able to have my body back for the most part (minus breastfeeding, if that works out), which will be great, but this will be last of all my “firsts” with a new baby. I suppose that’s probably how every parent feels. Counting down the days, though. This hip pain is the worst. After I’d finished working that day, I stopped at the store to pick up a package of three pregnancy tests and headed on home. I didn’t think I was pregnant, but I wanted to rule out the possibility. My period was several days late, despite the fact that I was on birth control, but I figured it had to do with stress. I’d graduated college a few weeks earlier, I was desperately searching for a full-time job, I had things going on in my personal life at the time… it had to be stress. It had to be, I was so sure, but the pregnancy tests were just in case. I’d been exhausted, but I figured that was a side effect of a new medication I was taking. I had some aches and pains that I didn’t have before, but that had to be stress too. No way it was pregnancy causing all that. I got home. I took the test. To my surprise, both little lines showed up pretty clear. It took me two more pregnancy tests to be convinced that I was, apparently, pregnant. You know how most women tell you how exciting and wonderful that positive test is? I’m not most women. My Facebook status from that day shows how not excited I was at the time. I was terrified. I was not ready for a child. I was barely a college graduate, I was in the middle of a pretty stressful job search, and those things in my personal life were not going to clear up themselves. I had a choice to make, and in the end, I realized that this felt exactly like what I was supposed to do with my life. That first ultrasound was a cool experience. To see that tiny little person growing inside of me on the computer screen was nothing short of amazing. It wasn’t until a week or two later that the reality of motherhood began to set in, and I began to feel connected to the little being I’d seen on that screen. I can’t say that it wasn’t hard for me to get used to the idea, but once it finally began to hit me, I knew there was nothing else I’d rather do. It was a long nine months. The terror subsided for a while, but as I neared my due date, it began to rear its ugly head again, and I found myself having regular breakdowns because I wasn’t ready. I couldn’t have that baby, I wasn’t going to be a good mother – but the moment I held her in my arms for the first time, all that doubt and all that fear just disappeared. I still think back to May 22, 2012, quite often, and I think about how my little girl has changed me in so many ways. Physically and emotionally, I’ve been changed forever. I’ve grown up so much in the last two years, and it’s because of her. Thank you for coming into my life, little lady. You have no idea how much you mean to me.